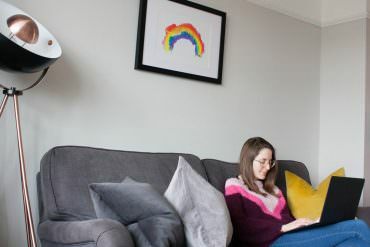 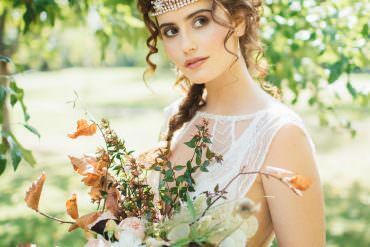 Goodness me, these images really are very inspiring today. 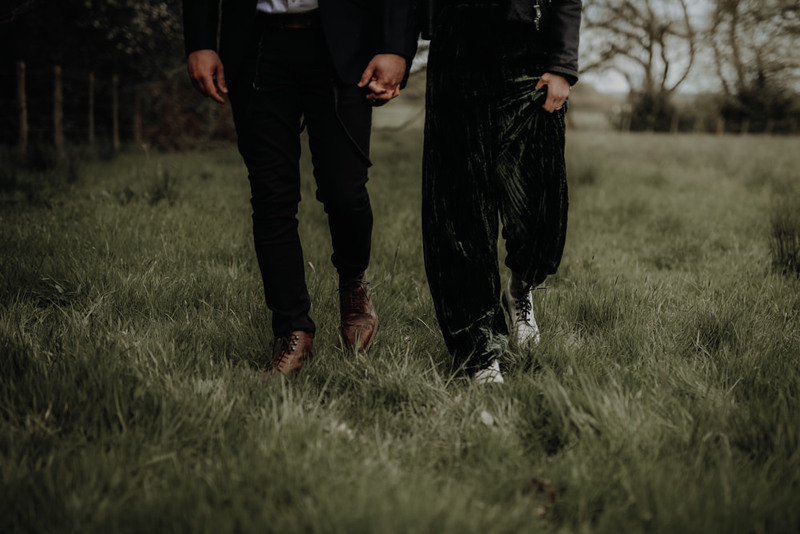 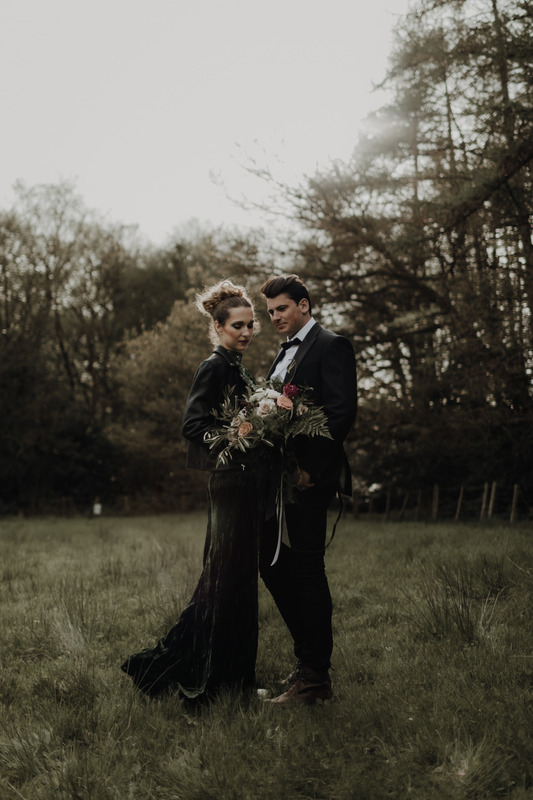 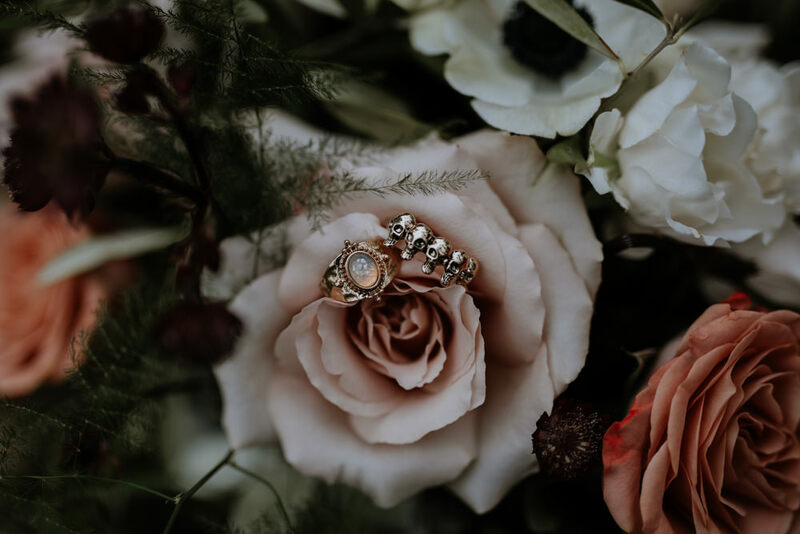 There has been a swing towards a more dark, moody and atmospheric style weddings of late and I am loving it! 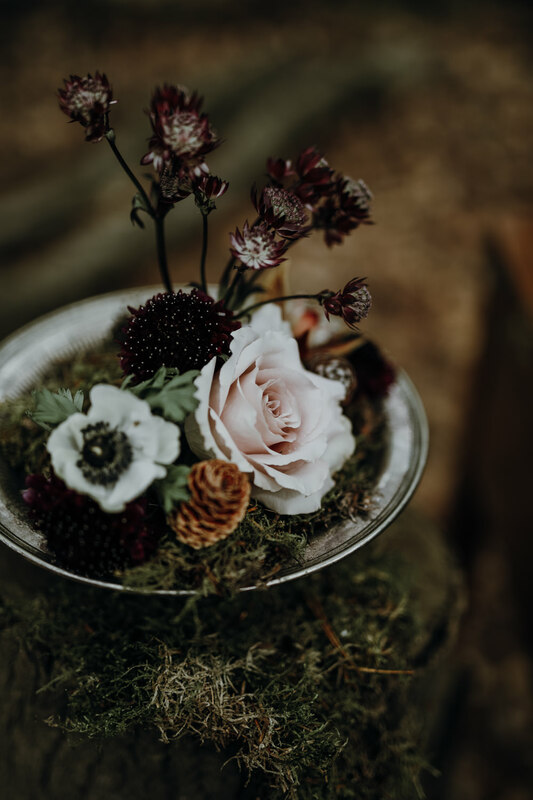 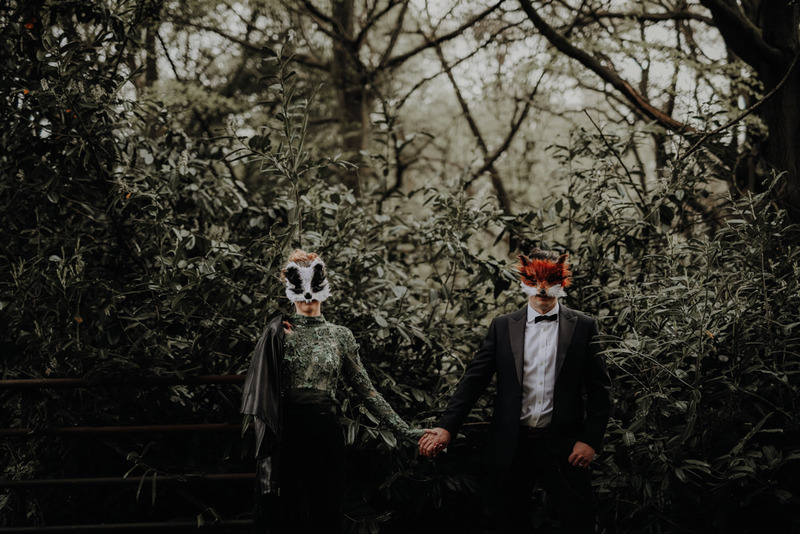 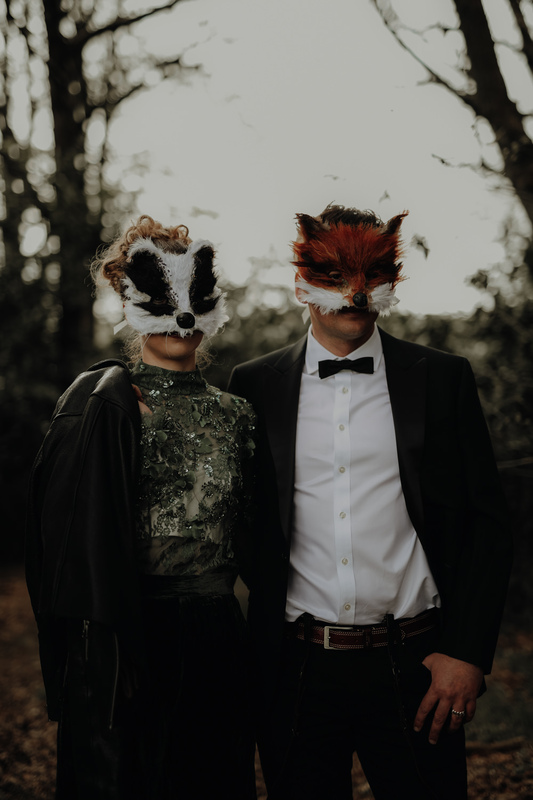 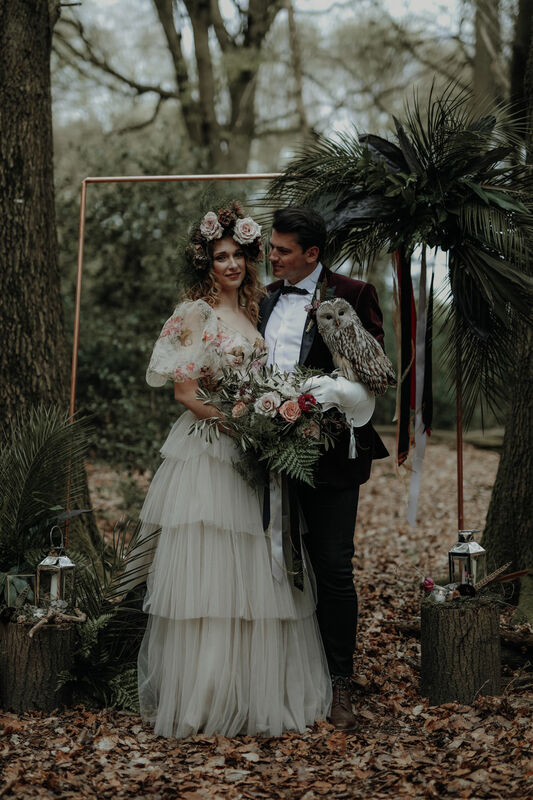 Take this editorial shoot brimming with wedding ideas and inspiration for example, the woodland wedding setting is just magical, the birds of prey haunting and the alternative bride and groom looks, so stylish. 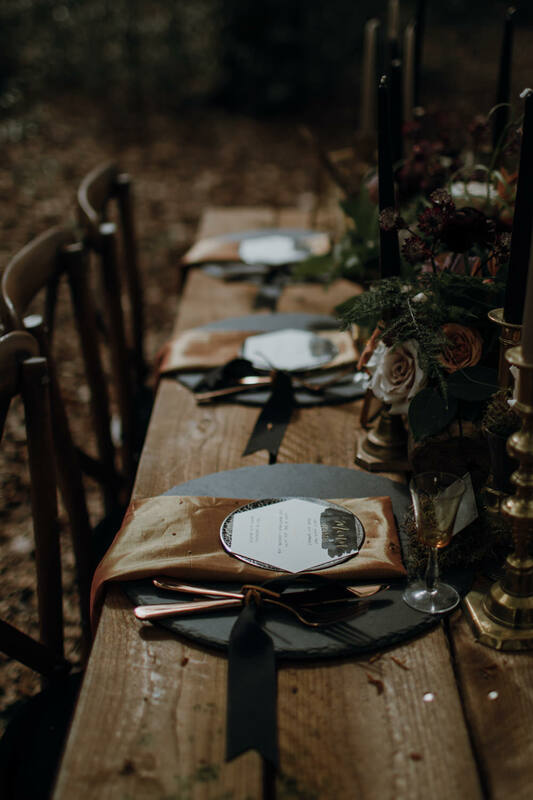 WWW fave and Supplier Love member Fleur De Lace was on board to style the tables and décor, wow was it all just beautiful. 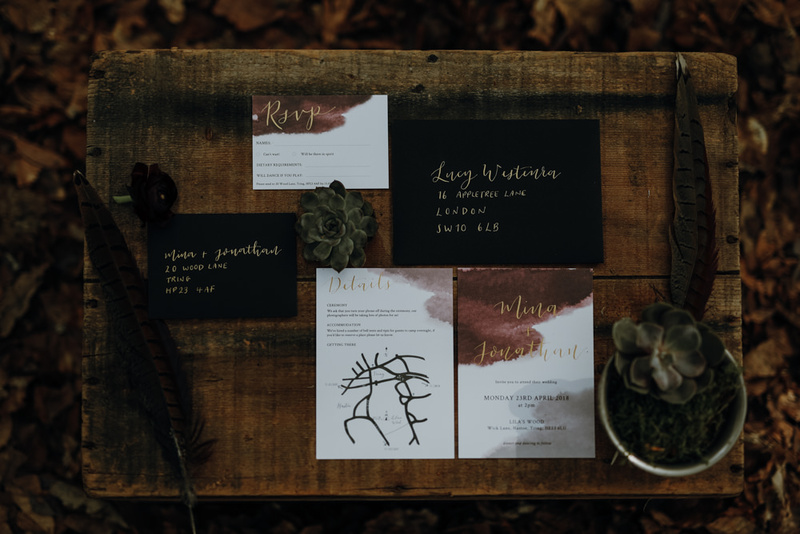 Black, gold and burgundy tones all worked in harmony together, with luxe calligraphy stationery, candles and divine blooms. 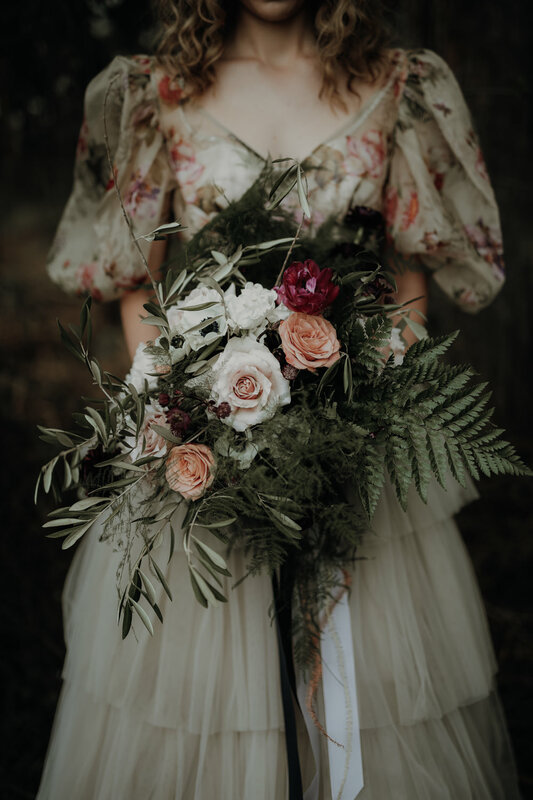 Talking of florals, the bridal bouquet is just something else guys; natural, wild and opulent. 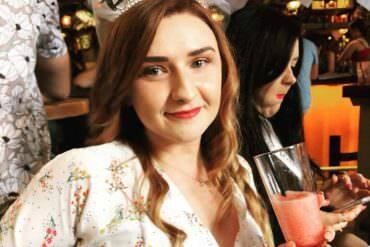 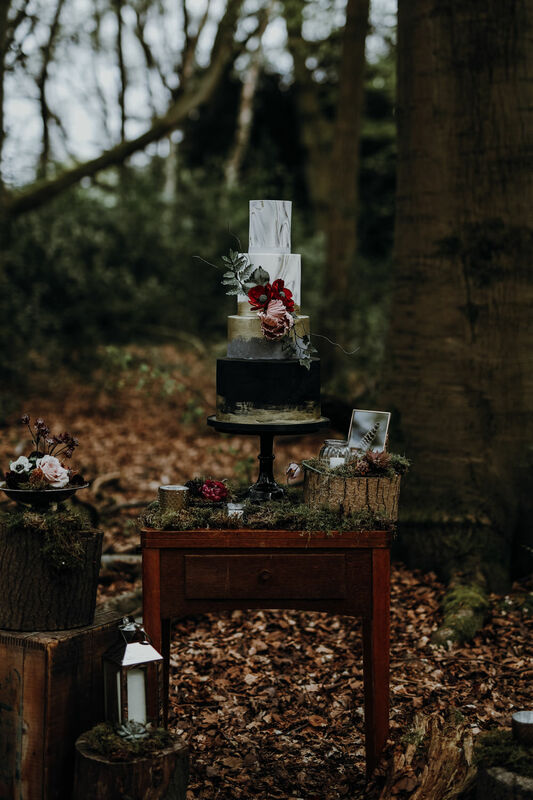 Keep your eyes peeled for a magnificent marble cake creation and an outfit change. 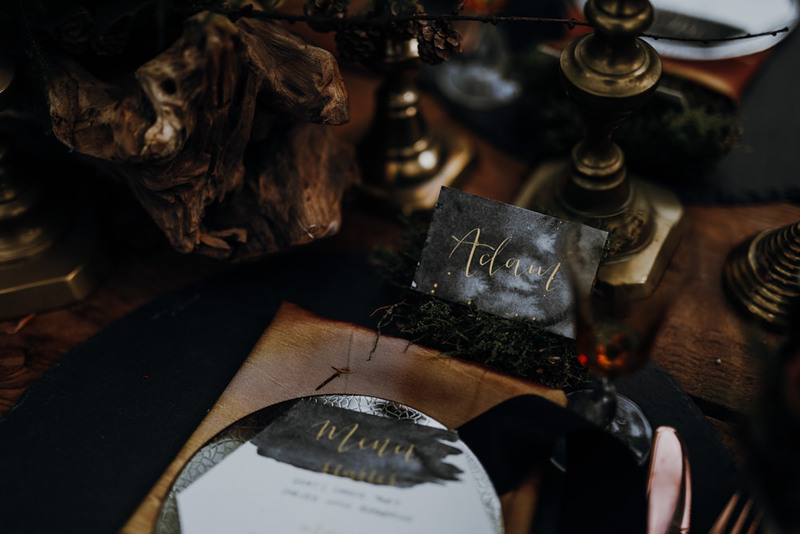 These beautiful shots were captured by Ayelle Photography and I am sure you will agree they are breathtaking. 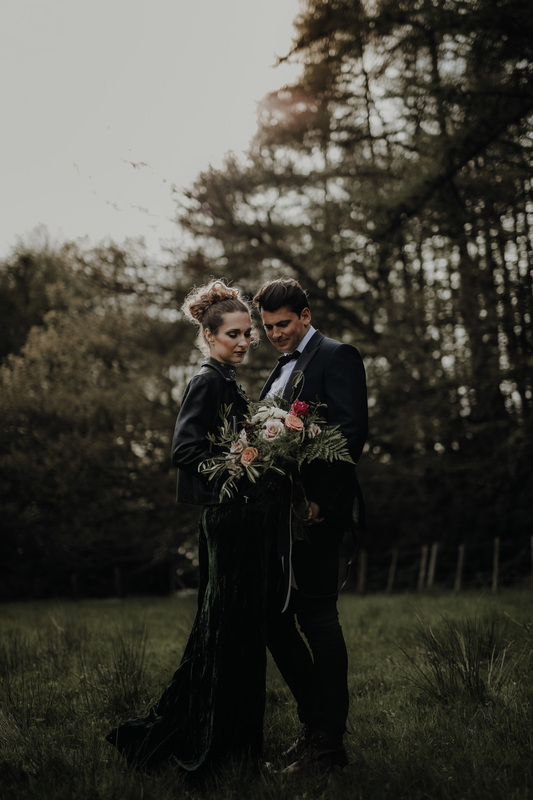 Celebrating connections, marriage and a natural love. 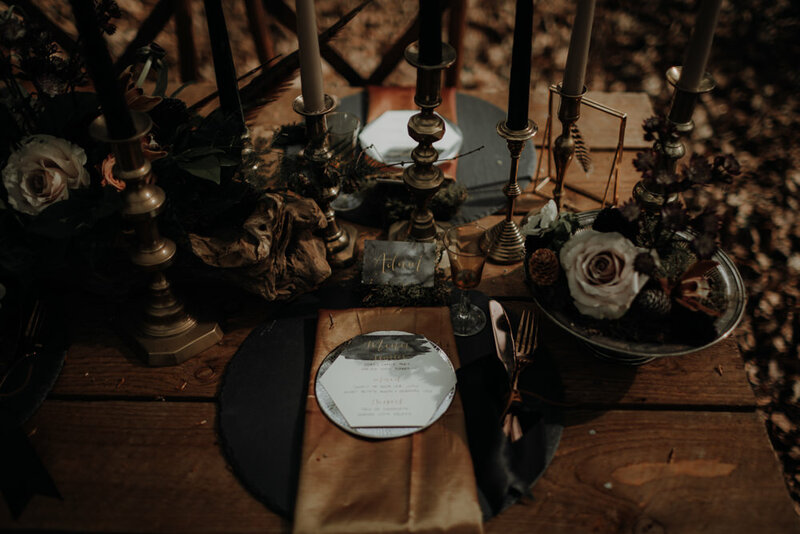 We wanted to create a contemporary interpretation of modern gothic. 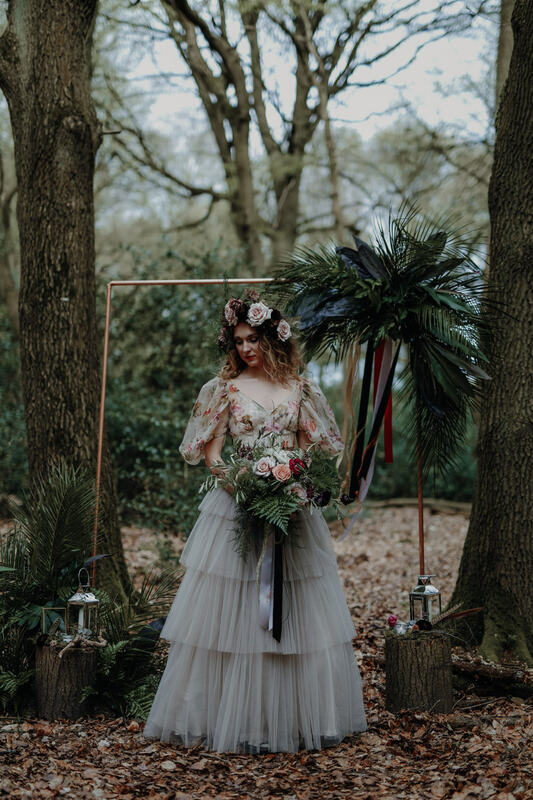 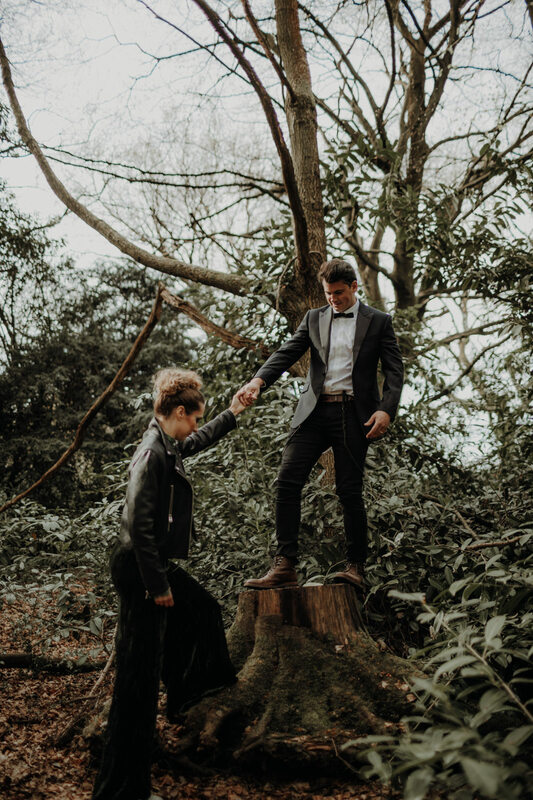 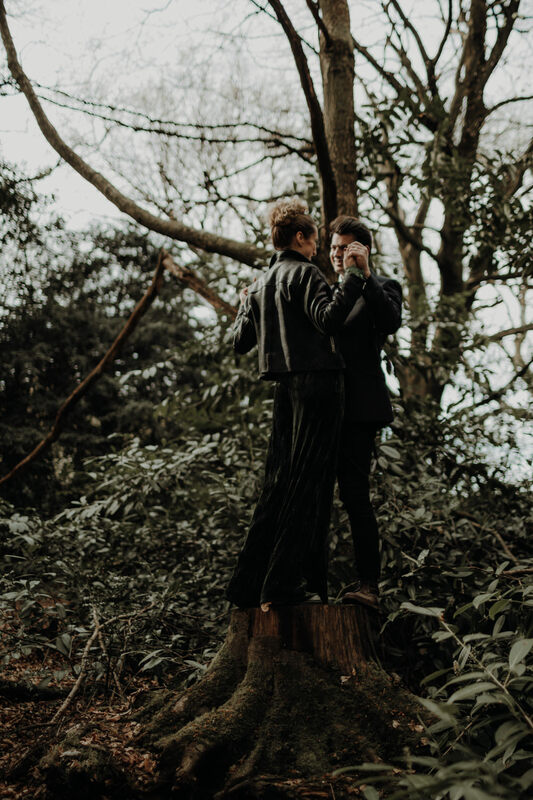 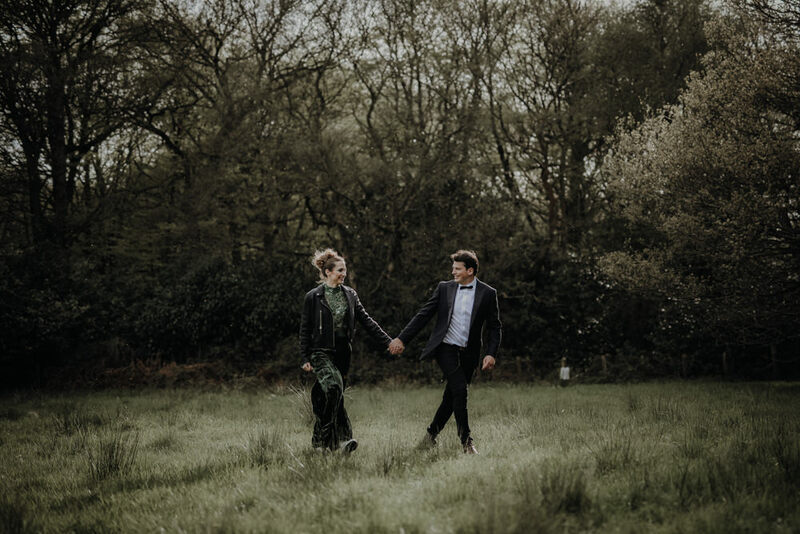 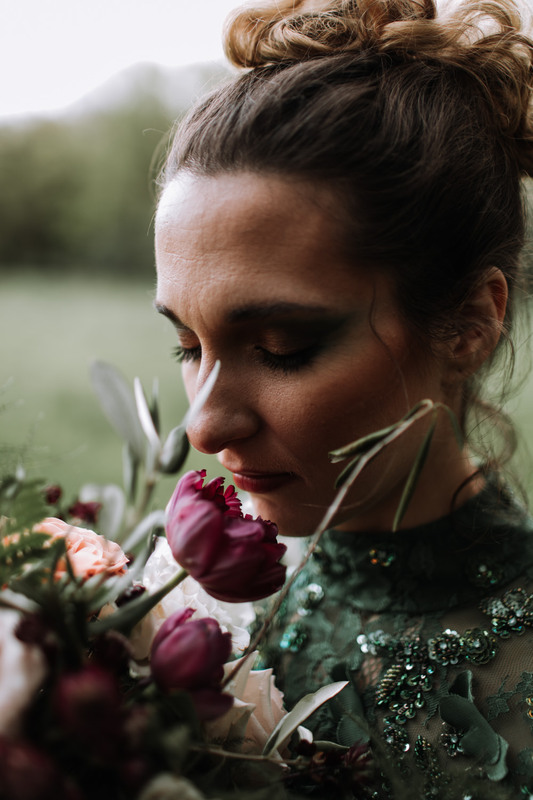 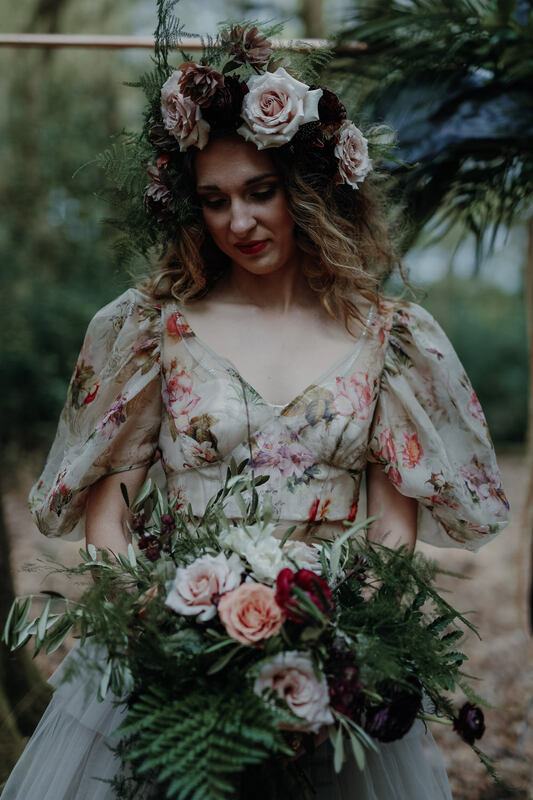 Inspired by nature, light and shadows; we were able to direct and craft a stunning, unique styled photo shoot in the heart of Lilah’s Wood, Tring. 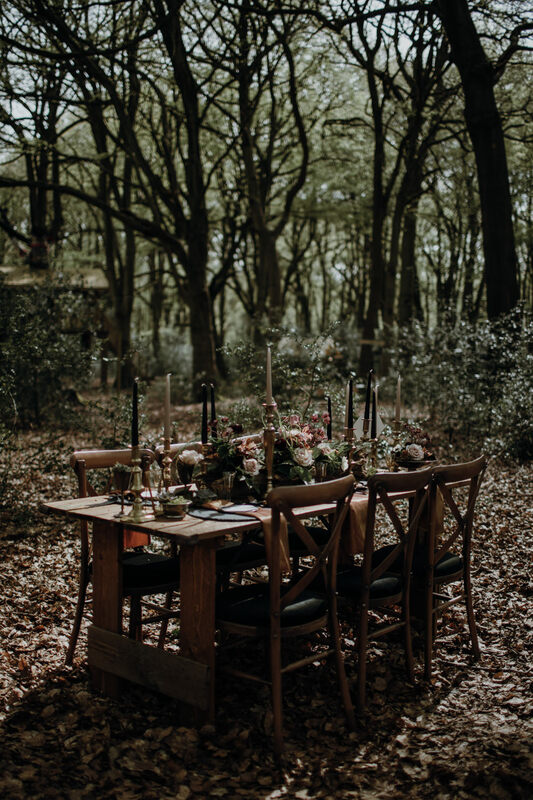 The most beautiful setting, for a beautiful mix of ideas. 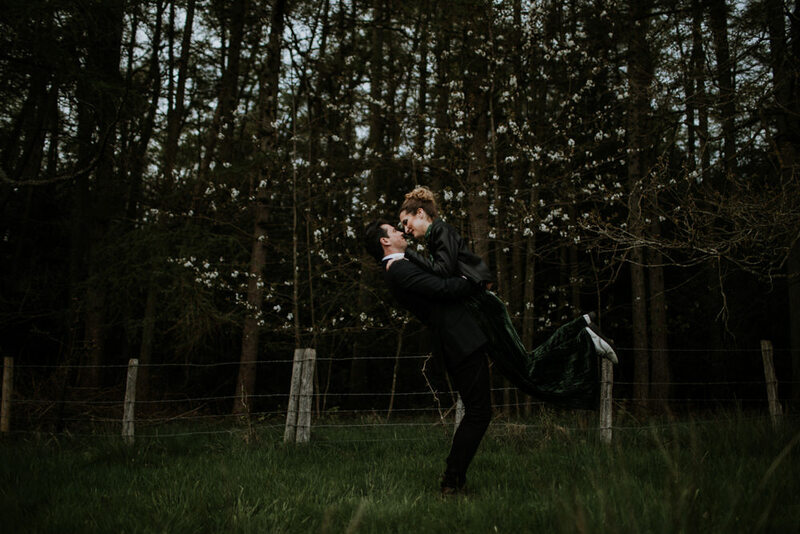 Our gorgeous models, a real couple, newly-weds; were the perfect pair for this romantic shoot. 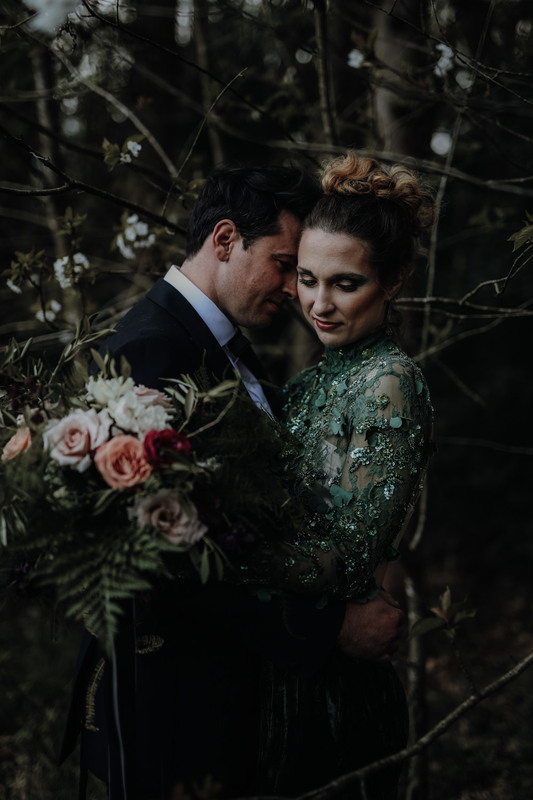 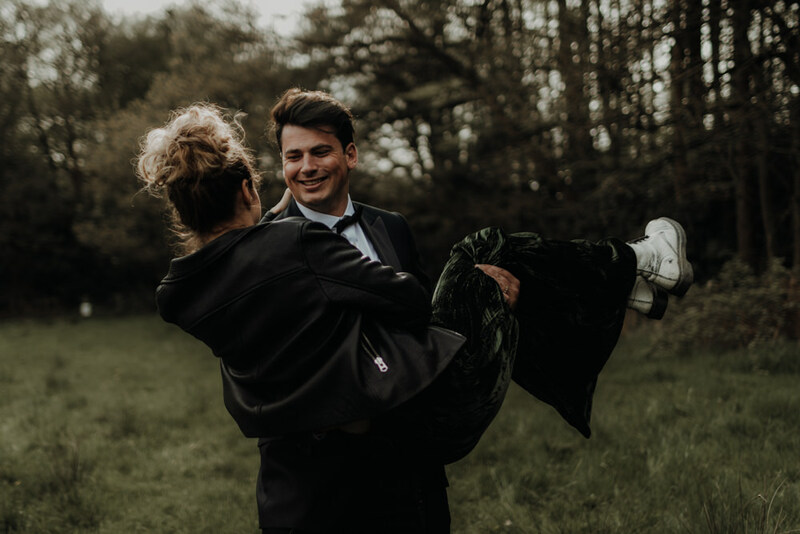 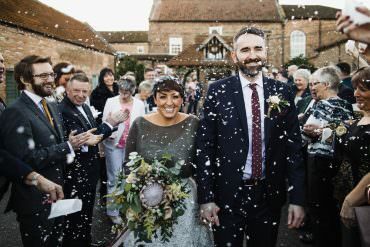 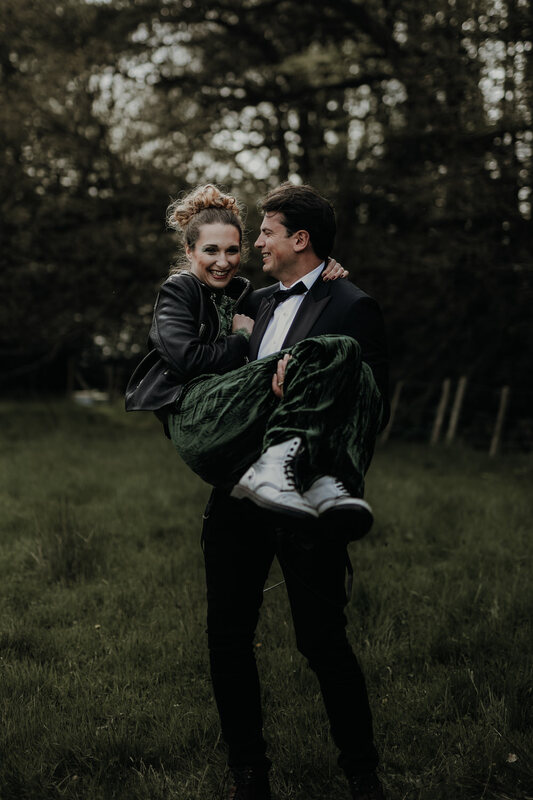 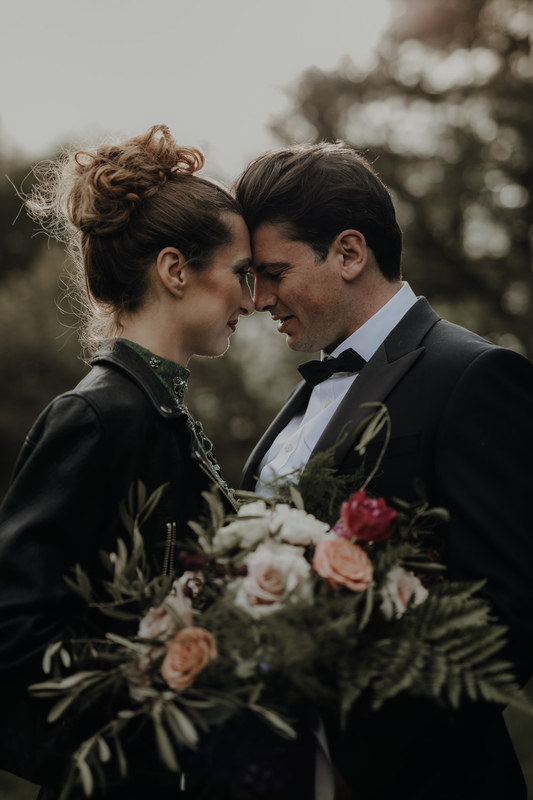 All loved up, with real emotions, tender touches and moments of silliness throughout, we knew their love for one another would be easily conveyed through the art of photography. 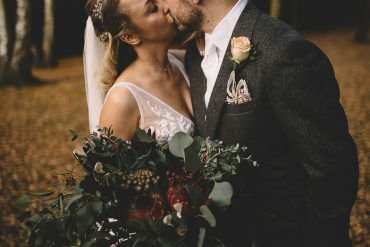 As wedding photographers organising and directing this shoot, that connection was really important. 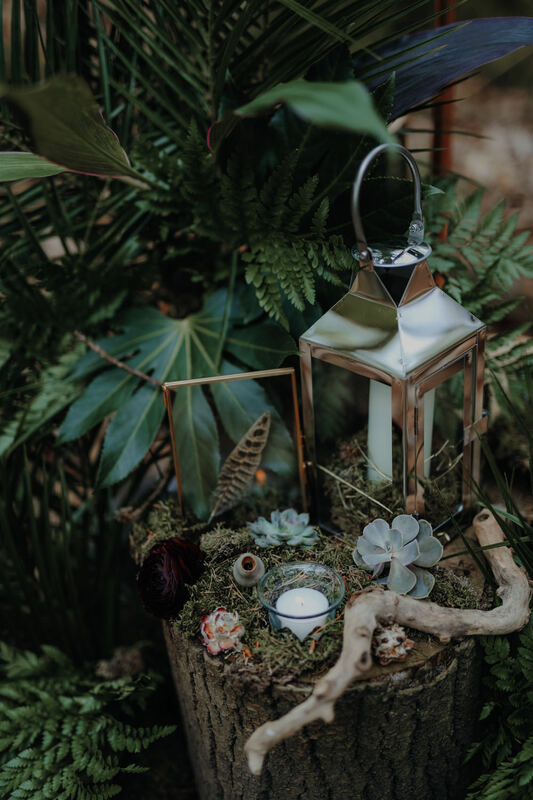 We wanted to create something authentic, something real and magical. 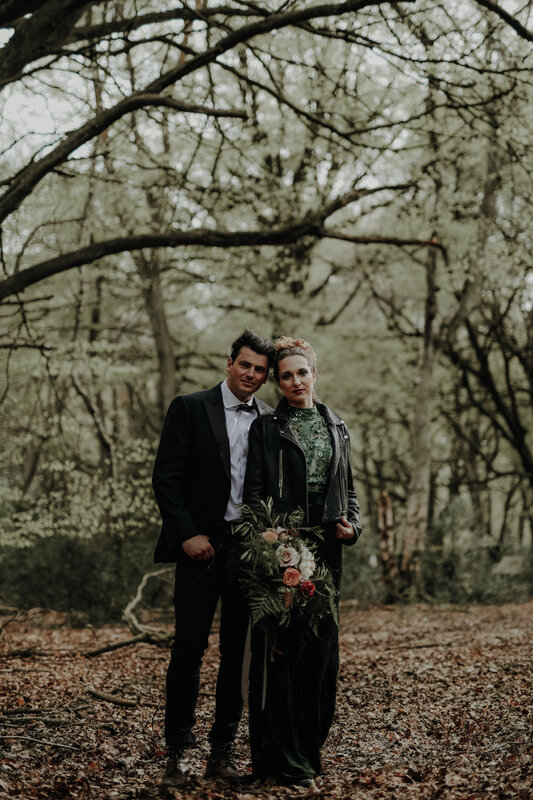 Our beautiful bride, a strong woman, bold and not afraid to be different. 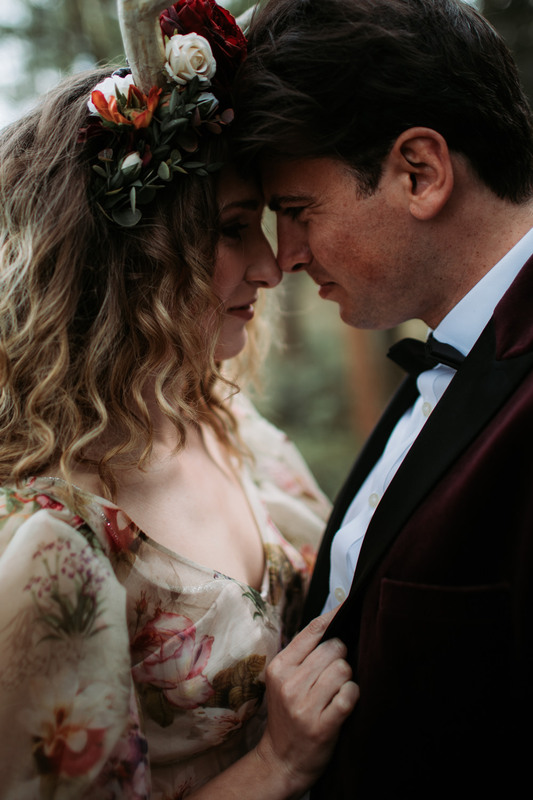 Alongside her handsome man, with his unique red velvet jacket. 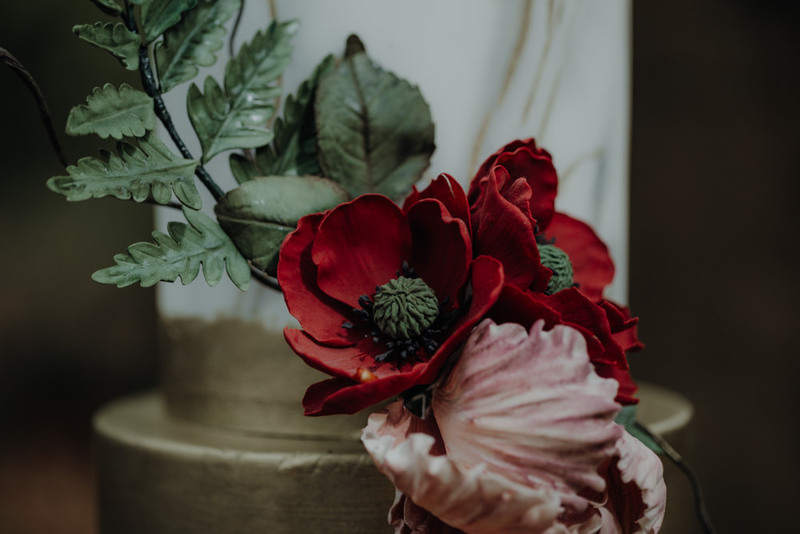 Red, being one of our main colours throughout, the colour of desire. 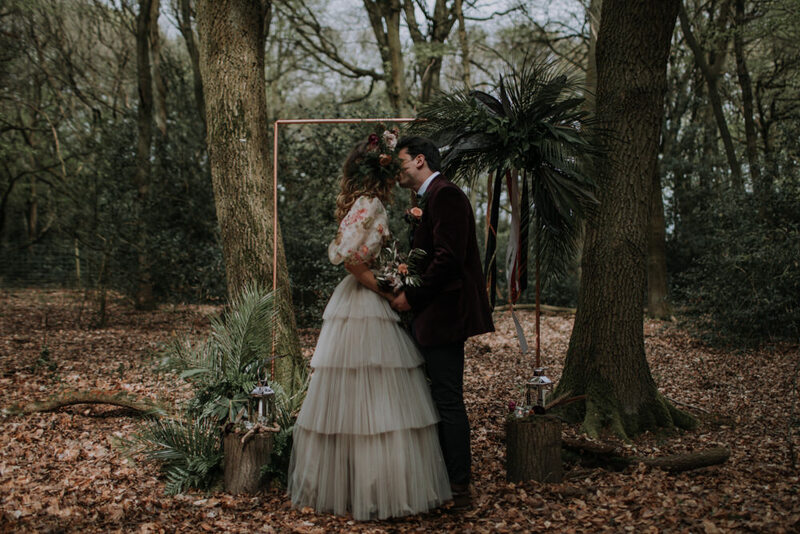 Our bride and groom are seen as untraditional, young, stylish and lovers of nature. 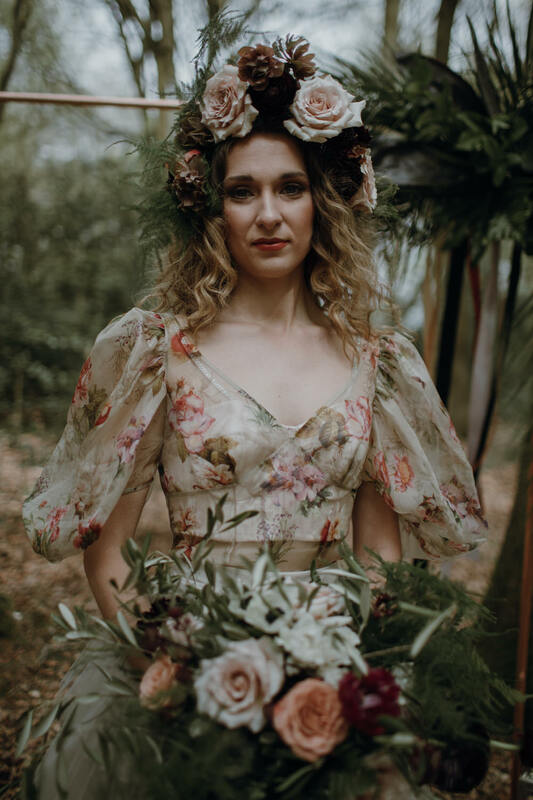 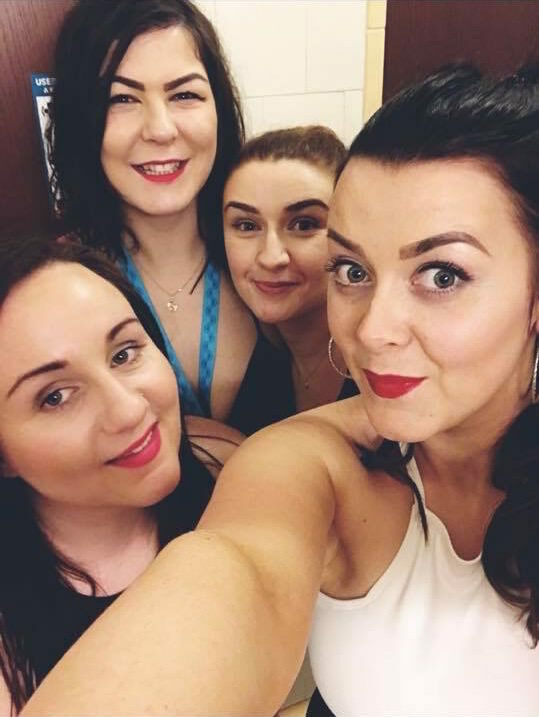 We focussed on two different looks, a daytime look combined with a more relaxed, evening look. 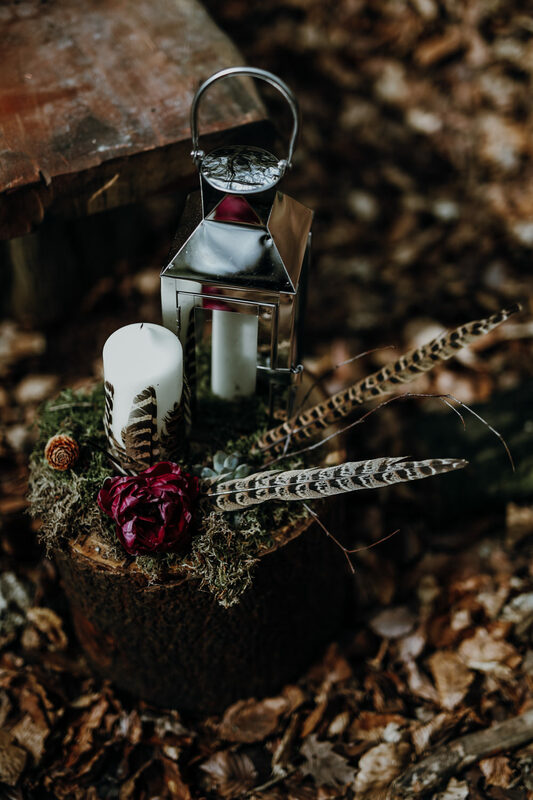 We also featured multiple birds within one of our set ups. 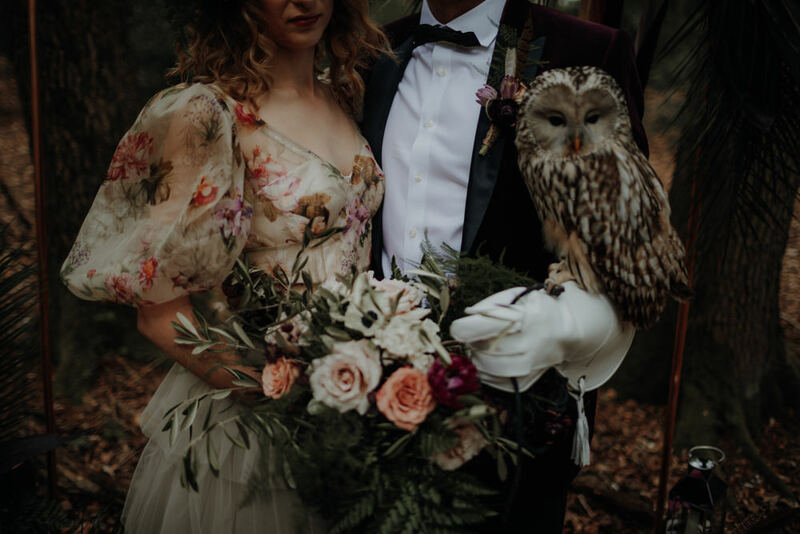 Two beautiful owls, perfect for this haunted love. 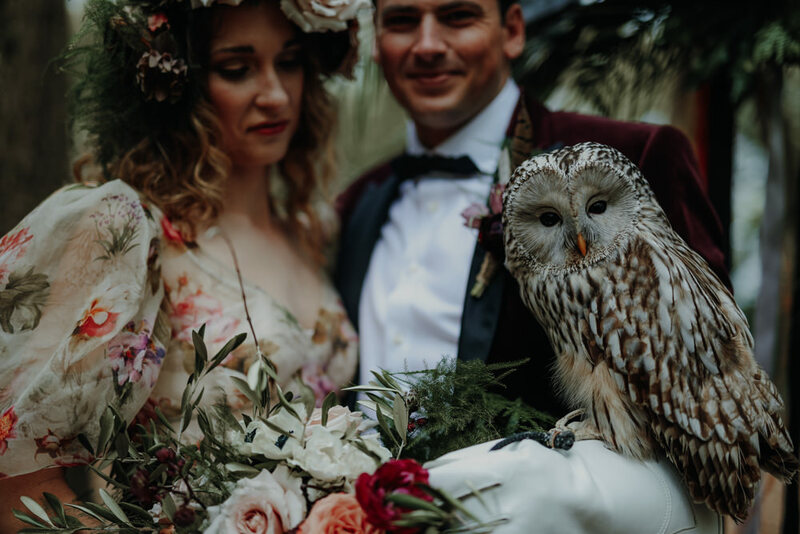 Owls live within the darkness, they’re mysterious, magical and a symbol of higher wisdom. 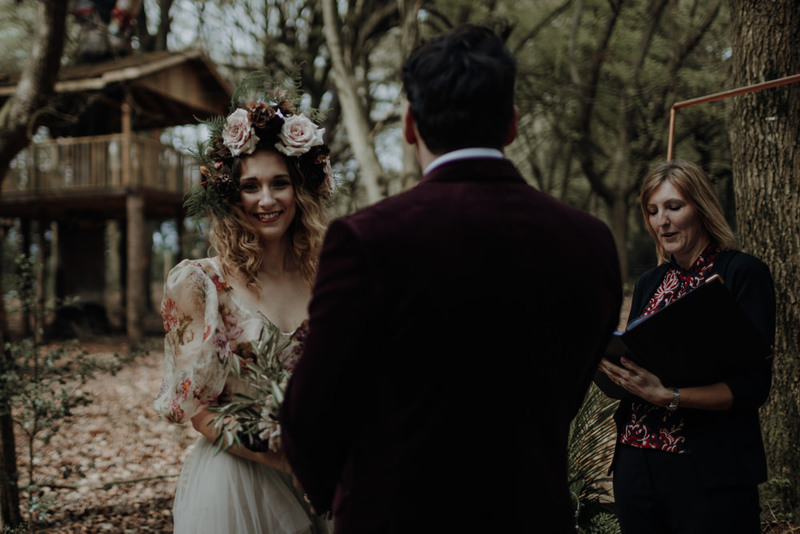 Our bride wore a beautifully handmade headpiece, perfectly crafted by the amazingly talented Love By Becky (alongside those mystical and amazing evening masks). 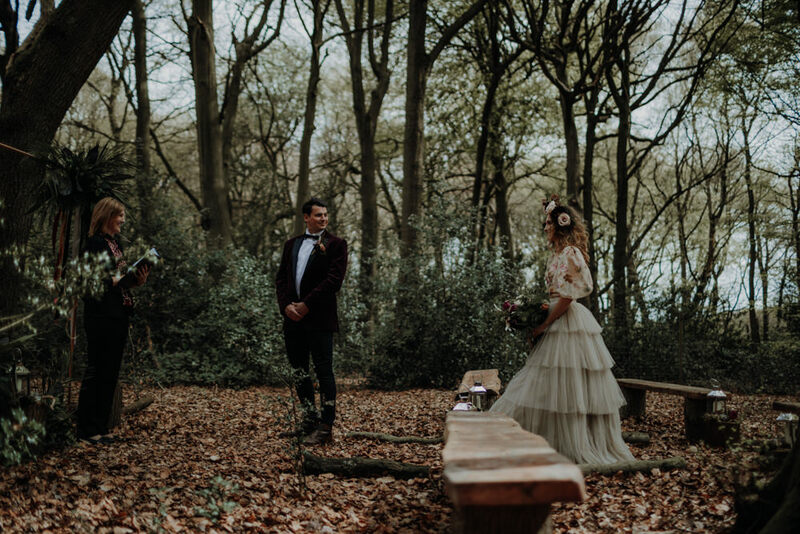 With eye-catching antlers, colourful, delicate flowers; this made our bride stand out, but also complimented this stunning environment. 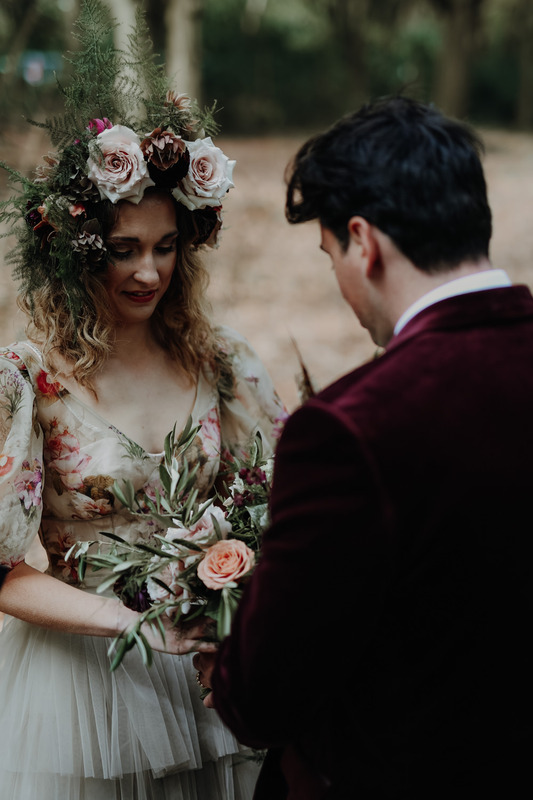 She also wore a delicate, stunning two-piece. 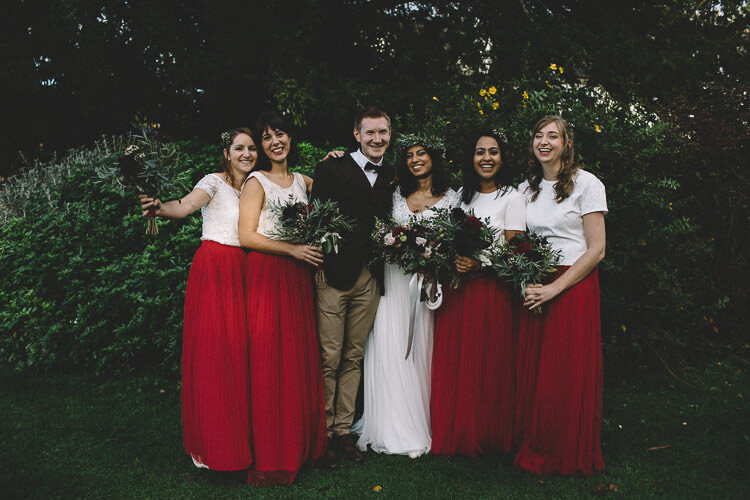 Provided by Woburn Bridal. 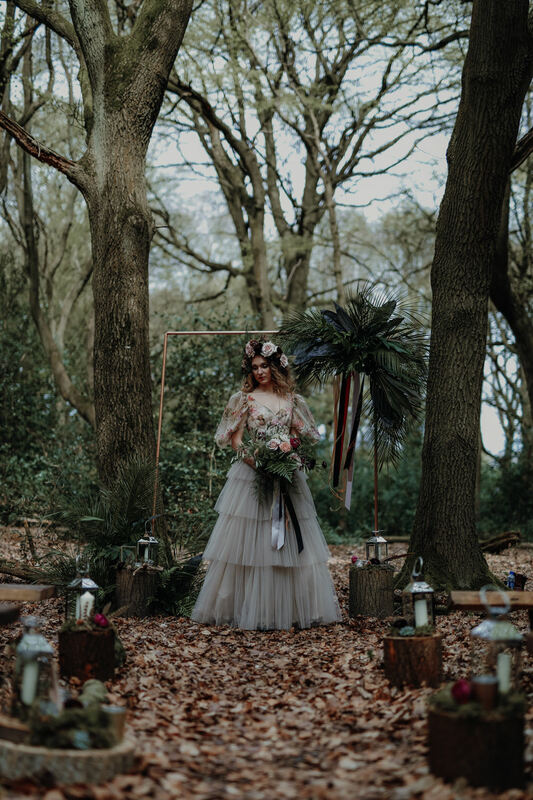 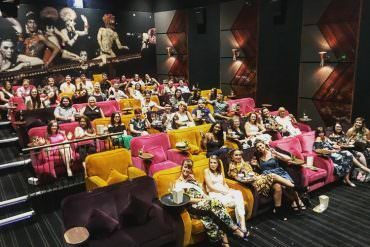 An absolute heaven for any modern day bride, a bride looking for something a little different; a place filled to the brim with elegance and selection. 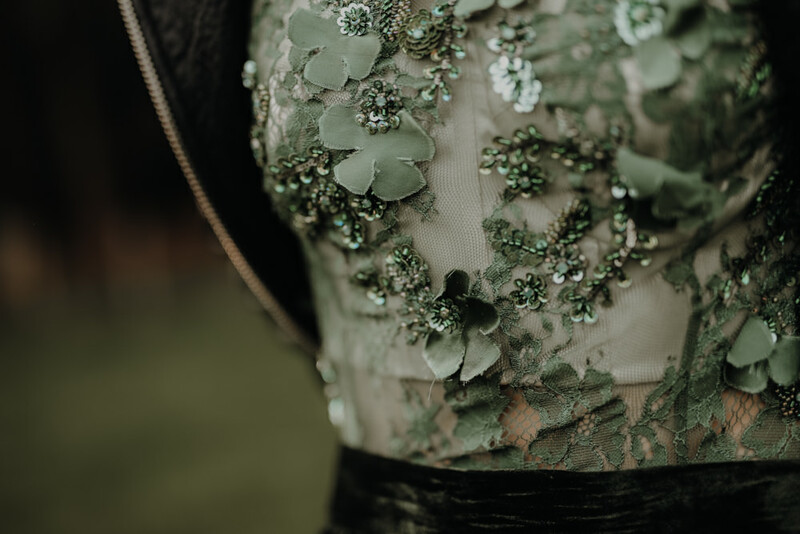 From gowns to accessories, to strikingly beautiful trousers. 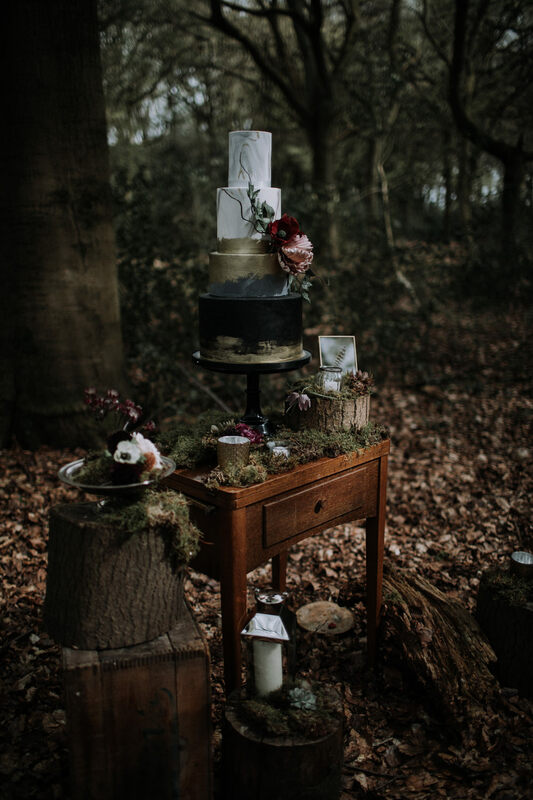 This was the perfect supplier for our shoot. 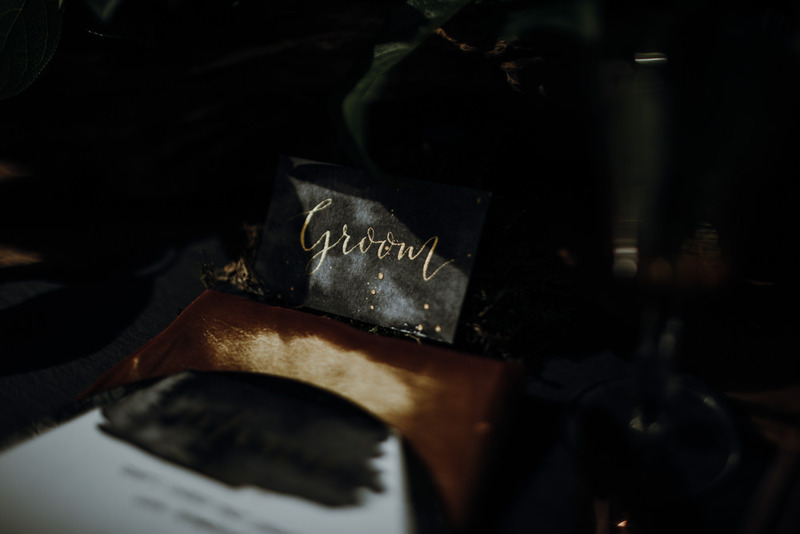 We chose to create a second look, a look to reflect the evening/party section of this wedding. 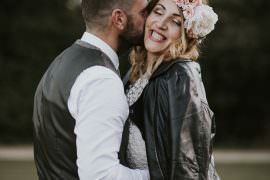 Time for our bride to pin her hair up, put her Doc Marten’s on and celebrate with her hubby in his classic tux. 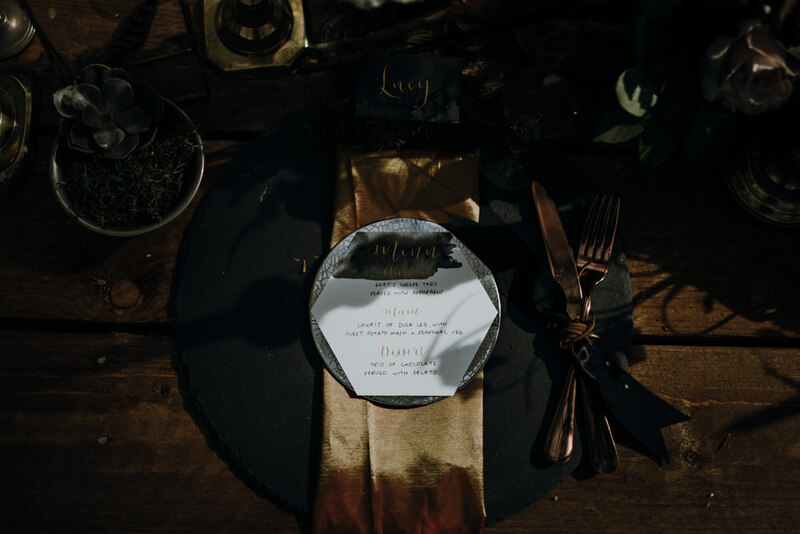 We considered all the details, with gold and bold rings and hints of red throughout. 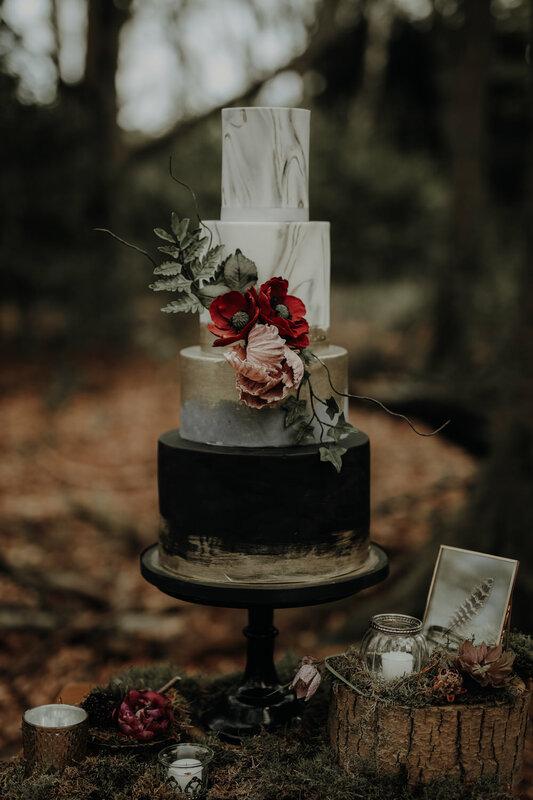 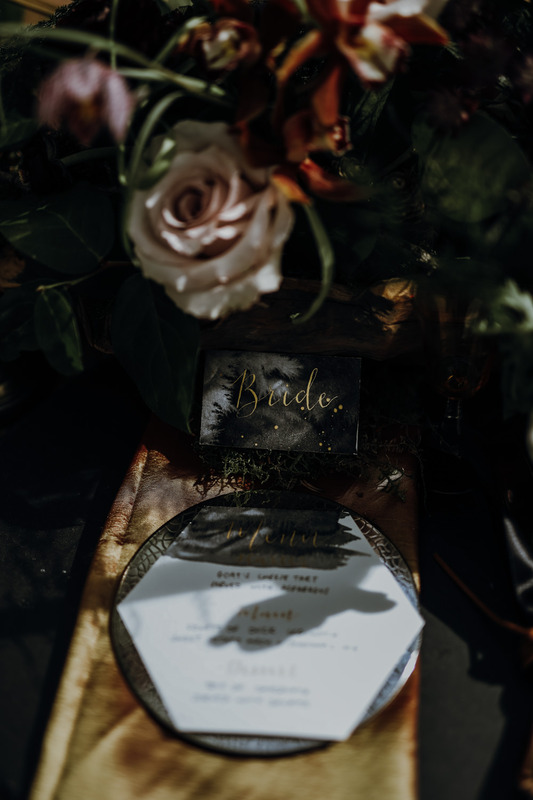 We had the most perfect cake (Meadowsweet Cakes) with gentle brushes of gold and delicate red flowers, the marbled effect coupled with the black icing made the best dessert for this moody and dark wedding. 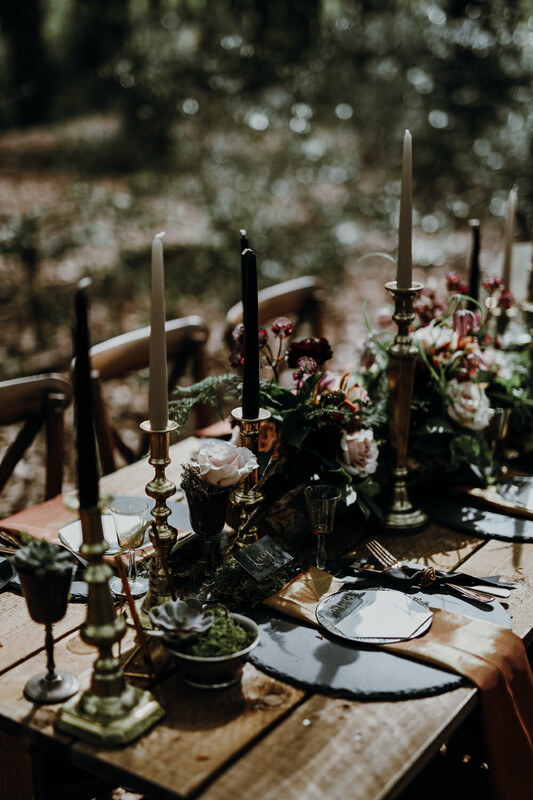 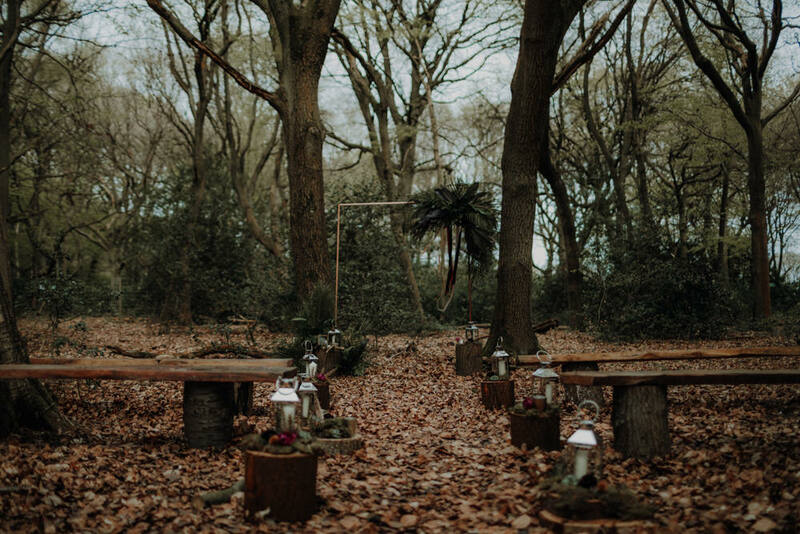 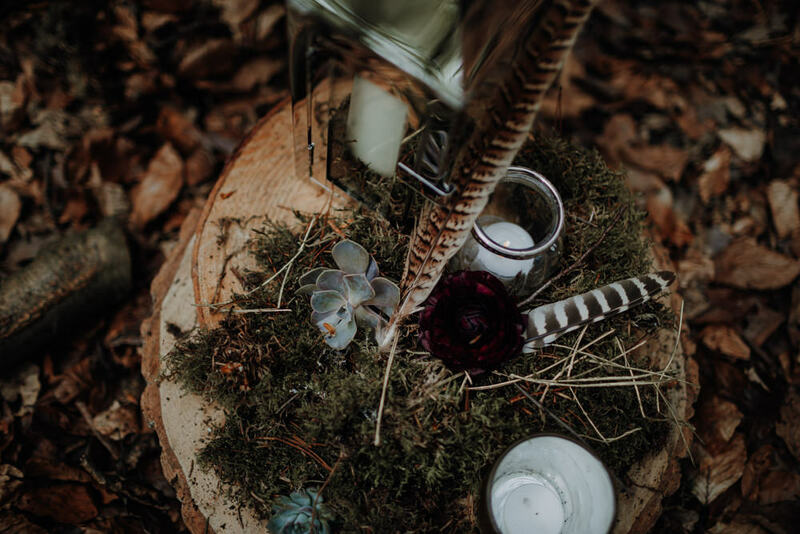 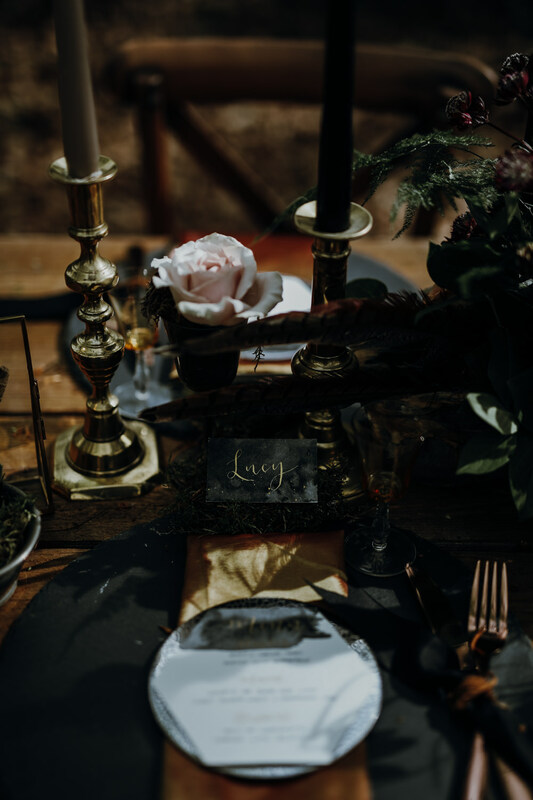 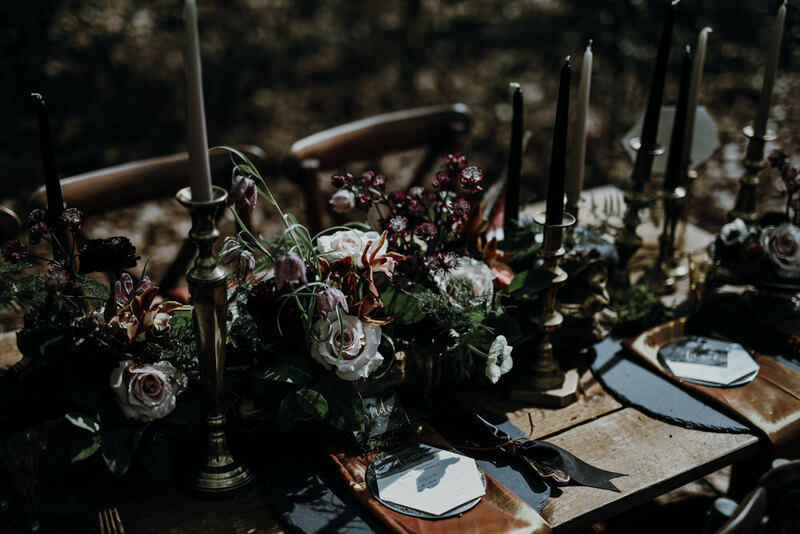 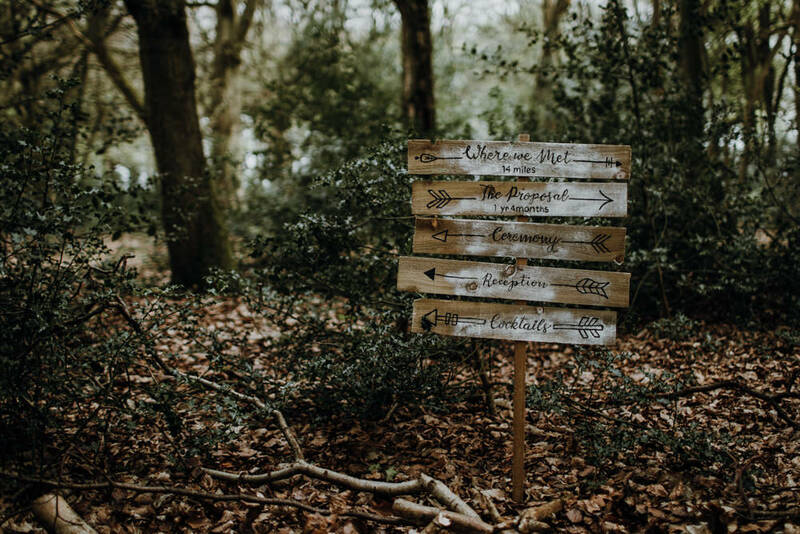 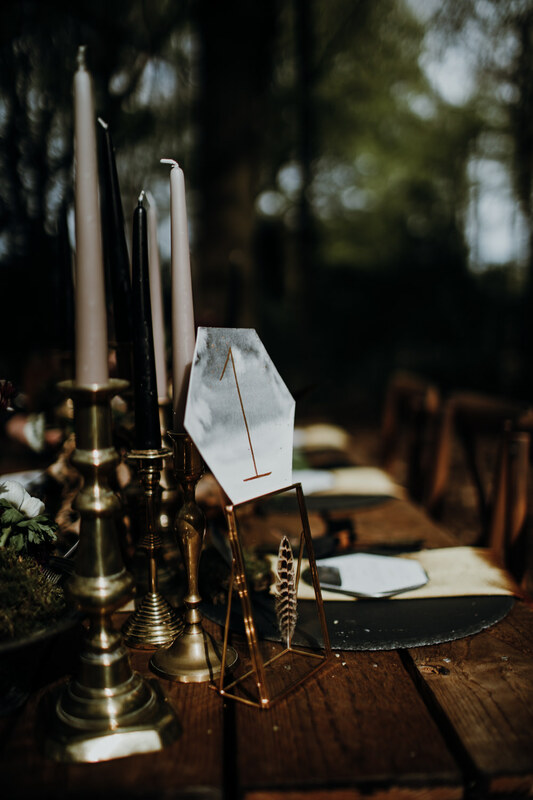 The ceremony and reception set ups were designed and laid out by the talented Fleur de Lace, dark candles, succulents, black ribbon, brass cutlery; this table made such a beautiful little spot within the woodland. 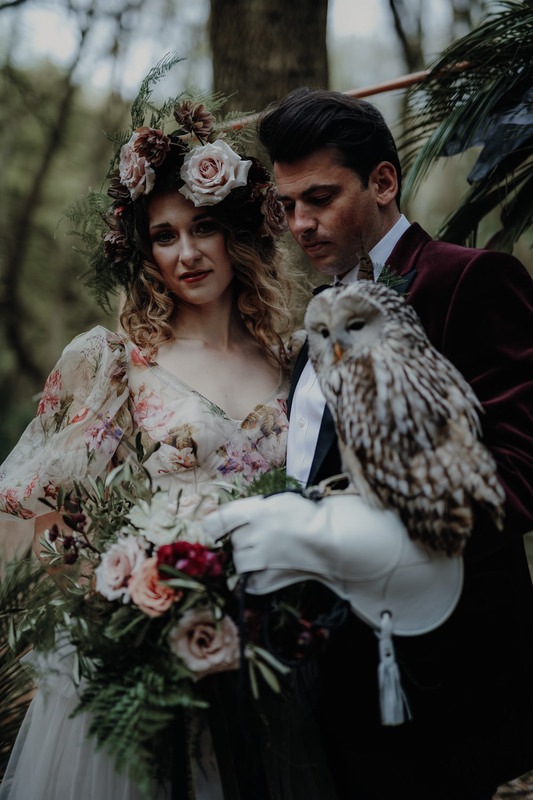 The colours complimented nature and also our theme. 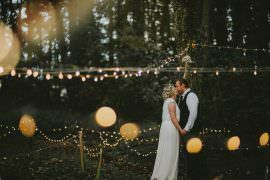 An intimate, romantic spot for our newlyweds to hang out and escape too. 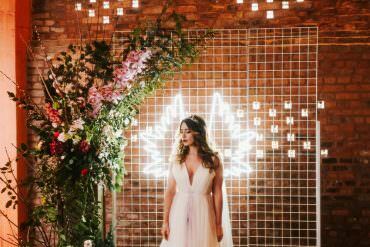 The floral arrangements were kindly provided by The Basement Florist. 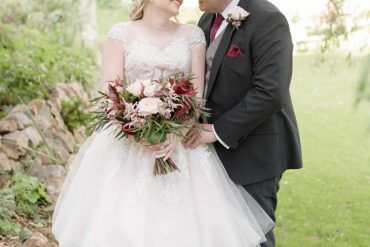 A large, wild and colourful bouquet with the prettiest pinks and deepest greens. 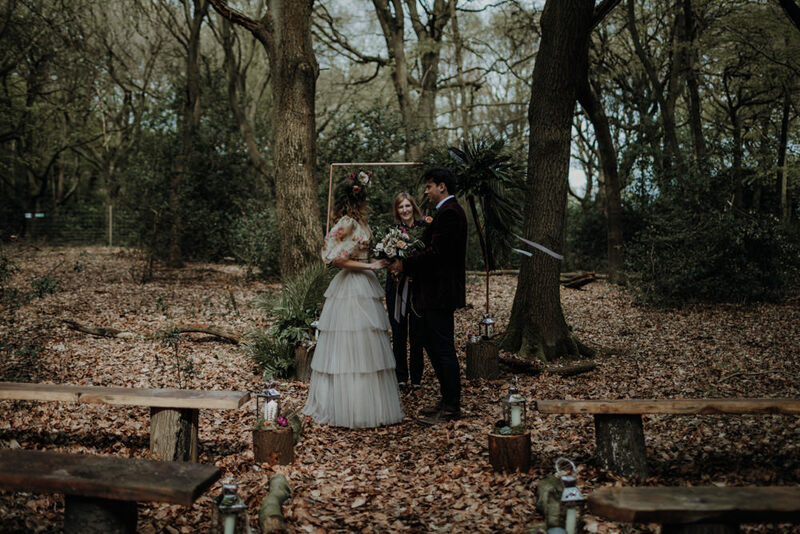 The flowers worked so well with the other visuals, bringing nature and humans together.